Variable ticket amounts, high operating expenses and security are just a few of the issues we resolve with low merchant account pricing and other industry specific processing solutions. Some restaurants may benefit greatly from processing credit cards with a wireless credit card terminal to use on location or a Pay At The Table System. In addition, our credit card processing machines are equipped to handle complicated features such as tip editing and tab forwarding, yet remain easy to use for the training of personnel. 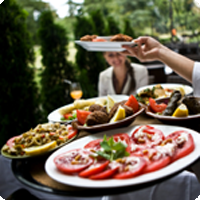 We have also developed additional targeted, revenue-generating solution incentives for the food services industry, such as customer repeat visit incentive programs, gift card programs, and more. A 1st Advantage Merchant Service New Jersey Representative can discuss these options and many more. Applepay and NFC Contactless Mobile Payment Devices FREE!